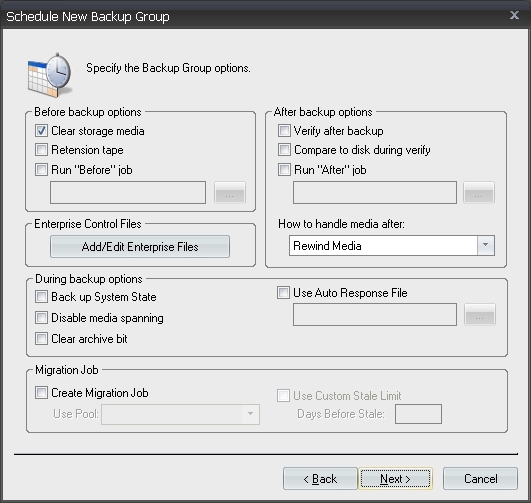 The UltraBac Backup Scheduler is used to create backup jobs consisting of one or more backup sets, to configure those jobs to use a specific device, and run them at a specific time, date, or interval. 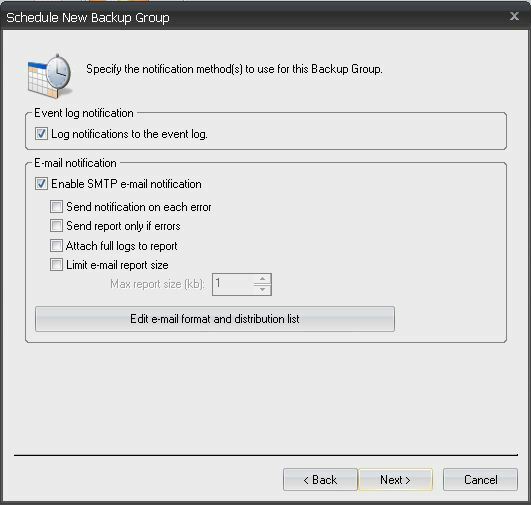 The scheduled backups can also be configured to send administrative emails, execute batch commands before and after the scheduled jobs, and can be run manually if needed. 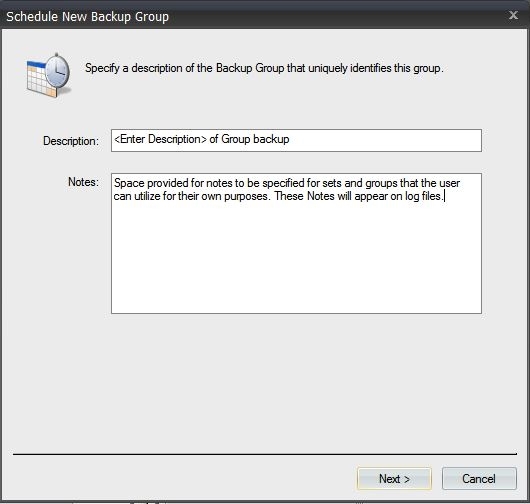 To launch the Scheduled Backup Wizard, select the Tools tab, and click "Backup Group." Type in a description that will appear in the "Scheduler" screen and in the backup log. Click "Next." Fig. 1 - Scheduled backup description. Highlight a set in the left column and click "Add" to move it to the right column, adding it to the backup. Sets should be added in the order they are to be run during the job. Click "Next." Fig. 2 - Selecting backup sets. Set the Before/During/After backup options, and click "Next." Fig. 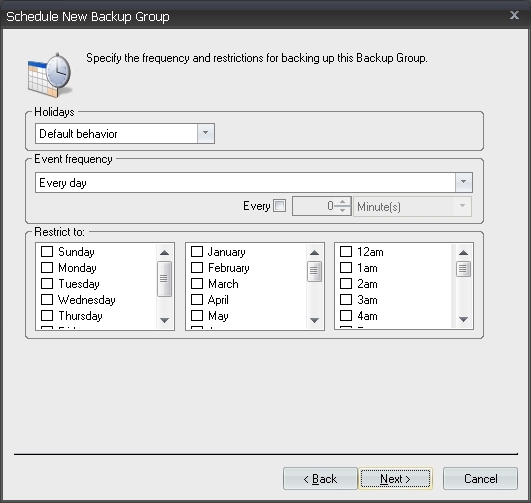 3 - Scheduled backup options. Set the notification options, and click "Next." Fig. 4 - Email and event log notification preferences. Highlight a storage device in the left column and click "Add" to move it to the right column, adding it to the backup. Storage devices should be added in the order they are to be used during the job. Set the storage device options, and click "Next." Fig. 5 - Setting the storage device options. Set the Backup Time Limit options (if applicable), and click “Next." 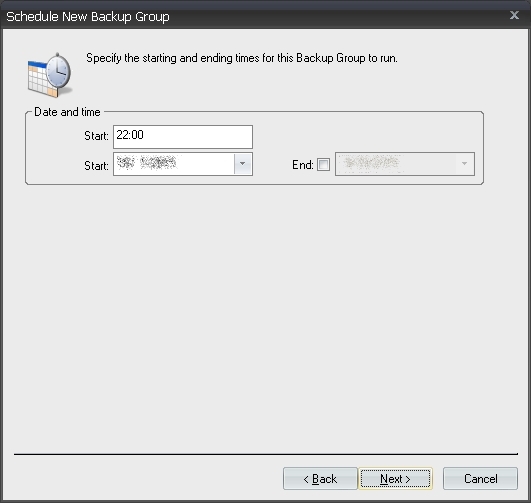 A scheduled backup can be configured to stop if it runs past either a specified amount of run-time or a specified clock time. 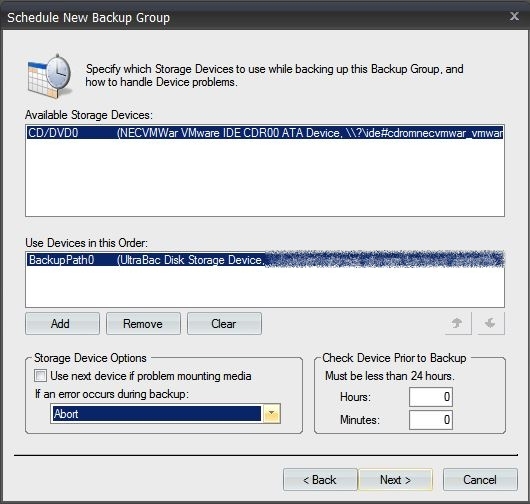 How the backup stops can also be specified. 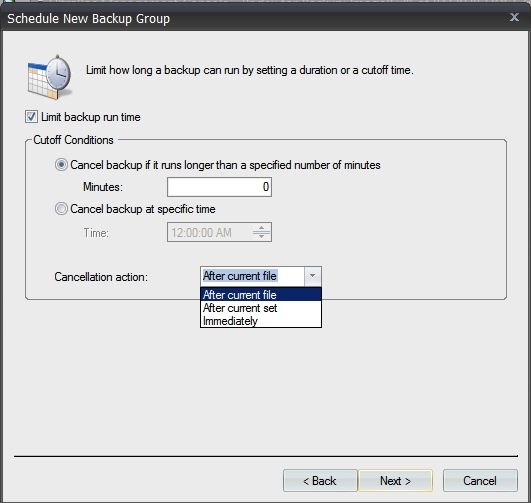 Limit backup run time – toggle whether a specified time will stop a scheduled job. Cancel backup if it runs longer that a specified number of minutes – set a maximum number of minutes the backup will be allowed to run. After current file (Default) – finish backing up the file in process, then stop. After current set – finish backing up the full set in process, then stop. Fig. 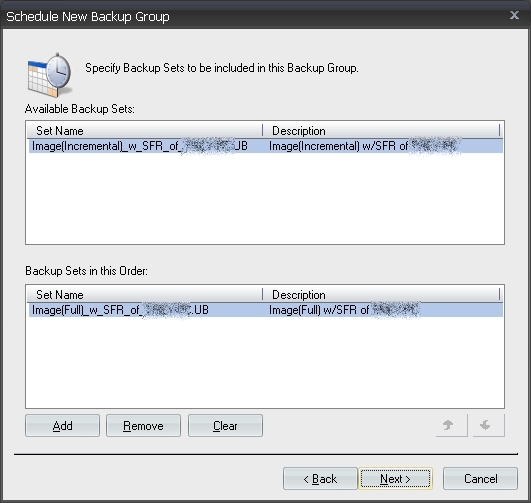 6 - Setting the backup time limit options. Set the options for the Media Library Controls (if applicable), and click "Next." Fig. 7 - Media Library configuration. Set the event time and date options, and click "Next." Fig. 8 - Setting the date and time of a scheduled job. Set the frequency/restrictions options, and click "Next." Fig. 9 - Scheduler repeat options. Type in a file name for the scheduled backup, and click "Next." 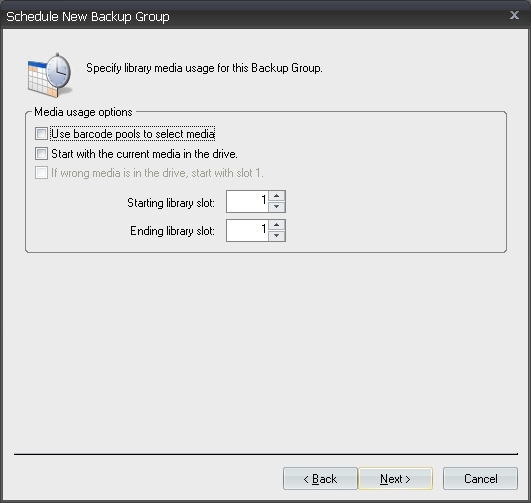 Click "Finish" at the "Summary" screen to enable the scheduled backup. Select the Tools tab and click "View Events," or press "F8." Scroll to the date and time of the job to delete. Right click on the job, and select "Delete." Fig. 10 - Deleting a scheduled backup job.